According to CB Insights, Dropbox has an irrational valuation because of a higher Price-to-Sales multiple than Box. Why would you even compare the two? Box is a public company. Dropbox is a startup. A late-stage startup for sure, but the fact that it is still funded by private money puts it in a completely different asset class. It’s irrational to value a private company using public-company metrics. By those measures, nearly every single consumer tech startup has a valuation of zero and their investors should go kill themselves. Tech company finance looks something like this: Startups start up with venture money and are expected to deliver explosive growth. Many fail, some survive and continue to grow. One day, when the companies have grown into stable mature cash-flowers, they reward their venture investors by going public. Public market valuations should reasonably be lower than private company valuations. After all, public investors are just cashing out the private investors who already rode out the exponential growth. That’s why it’s called an exit. I was having dinner at Kleiner-Perkins some weeks ago. It was an event for female engineers, hosted out of the goodness of their hearts, nothing to do with mitigating bad press from the Ellen Pao lawsuit, and KPCB is totally not sexist. I asked a senior partner whether he was worried about overpriced startup valuations, given KPCB’s later-stage investments. How much upside could possibly remain? Maybe the prices could even fall before exit? We’re not worried, he said. We have downside protection due to liquidation preferences. Box is a good example. Coatue and TPG bought $150M worth of Box shares at a $2.4B valuation. Box went on to IPO at only $1.7B valuation. Coatue and TPG should have taken a loss, but no. Their term sheet included a ratchet, which gave the investors as many additional shares of common stock as needed to guarantee they would not lose money. Coatue and TPG could have agreed to a valuation of a trillion. Who cares? The investment was upside-only*! This isn’t venture capital, this is a variable annuity. Allowing venture capital firms to self-value their investments is like inviting a bank to rate its own credit instruments. Who makes up for the deficit if a company doesn’t actually exit at the magical made-up valuation? We work through the cap table until all preferred shareholders are paid out. These are the people who put money into the company. The common-stock employees pick over whatever remains. Unfortunately, many startup employees end up with underwater stock options. Employees aren’t even complaining about a tech bubble because they have catered lunches and on-site masseuses. Paper billionaires Evan Spiegel, Travis Kalanick, and Elizabeth Holmes are certainly not complaining about a bubble. The ones bitching loudest about the bubble are the ones close enough to see the action, but not close enough to get invited to the party. Sorry we didn’t invite you to the Sand Hill Exchange party round, Mark Cuban. *Okay fine, sometimes a billion-dollar company can completely implode, like Fab. And then nobody gets anything. Apple has raised less money in its entire 4-decade lifespan than most of today’s startups. In 1980, Apple (AAPL) raised $97M in an IPO. In 1997, Apple received a $150M investment from Microsoft. Apple hasn’t seen a dime of outside investment beyond that. The AAPL shares in your Roth IRA? You bought that from a secondary trader on NASDAQ, who bought them from someone else who paid Apple 0.4% of your purchase price. With only $247M in outside investment, Apple bootstrapped itself to become the second most profitable company in America (behind Exxon Mobil). To be fair, $247M was a lot of money back then. But Uber and Box and their billion-dollar rounds can’t even touch that. 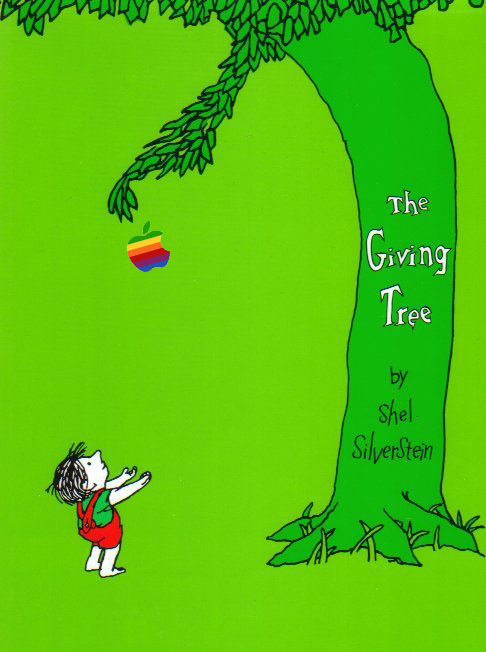 What more, AAPL has given so much more than it’s received. To date, it has issued $21.8B in cash dividends and spent $52.8B on buybacks. Why is Apple so generous to shareholders who have given it so little? It’s not AAPL’s job to prop up Carl Icahn’s net worth, or to provide for everyone’s retirement fund. Apple only cares about its share price because its board and employees receive some compensation in stock options, and share prices can lead to more favorable terms for debt financing*. Also I guess they don’t want to look like a cheap acquihire target for Yahoo or Facebook or something. Disclosure: I am long AAPL. *Apple issued $12B in corporate bonds this year. They have $151B in cash, but it’s cheaper for them to borrow money at low interest rates than to pay taxes to bring the cash back from overseas.